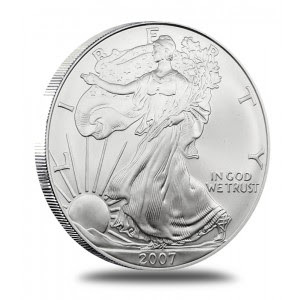 American Silver Eagle bullion coins have been in a repeating pattern when it comes to their monthly sales this year. One month will show a decline only to be followed the next month with an increase. This pattern was followed yet again in May when United States Mint authorized purchasers ordered 2,875,000 of the silver coins, logging an increase of 1,355,000, or 89%, of the number delivered in the previous month. Despite the large advance, sales were diminutive compared to January when U.S. Mint sent out 6,107,000, the second best monthly total of all-time. But still, May easily ranked above all of the other months this year. Looking at the month of May in general finds 2012 had the third best one since the Silver Eagle first appeared in 1986. Figures come in behind May 2010 when 3,636,500 were sold and May 2011 — which currently holds the title as the best May ever — when 3,653,500 moved. The next closest May was in 2009 with sales of 1,904,500. 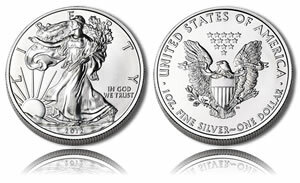 It is not too surprising that the American Silver Eagle bullion coin this year has had it tough against 2010 and 2011. These years currently hold the top two spots for annual sales. 2010 hit 34,662,500 only to be surpassed in 2011 with 39,868,500. So far, 2012 is lagging. Annual sales are at 14,534,000. In comparison, January through May of 2010 saw 15,167,500 sold while January through May of 2011 reached 18,901,500. The America the Beautiful 5 oz Silver Bullion Coin is also a bullion product currently available from the United States Mint. Each of these coins are struck from five ounces of .999 fine silver and, like the American Silver Eagle, are sold through the Mint’s authorized purchasers for a small premium above the current spot price of the silver contained within them. America the Beautiful Silver Bullion Coins showed significant gains in May owed to the release of the 2012 El Yunque National Forest Silver Bullion Coin late in the month. It joined three other 2011-dated coins of the program which are still available. In total, 5,600 coins sold versus the 200 in the previous month. The following chart shows the four ATB Bullion Coins and their performances through to the end of last month. Four more America the Beautiful Silver Bullion Coins are expected to be issued later this year. They include the Chaco Culture National Historical Park Silver Bullion Coin, the Acadia National Park Silver Bullion Coin, the Hawaii Volcanoes National Park Silver Bullion Coin and the Denali National Park Silver Bullion Coin.